We have a new water filter at home!!! Now I really understand why my parents never used to spend on stuff like clothes and bags, but when it comes to stuff like home appliances such as air conditioners, air purifiers and water filters, they're more than willing to spend on good ones. I've personally heard a lot about Cleansui, a water filter brand from Japan since years ago. But you know, the naive me assumed that if it's a good brand from Japan, it should be expensive. So when we purchased a water filter for our home 3 years ago when we first moved in to our new home, we settled with another water filter brand and didn't really give much thought to Cleansui. Until recently when I was invited by Cleansui Malaysia to try out using Cleansui's latest water filter, only did I find out so many things that I didn't know about the brand! 1) It is PORTABLE = TRAVEL FRIENDLY! When I heard that this is a portable water filter, I was so happy cos that means we can have clean water to drink from wherever we go, whenever we travel!! For (i), there's really nothing much we can do about our air quality (read: haze) except to stay indoors, keep our doors and windows shut, turn on the air purifier and aircond and even wear a mask while indoors. But for (ii) clean water, no matter how dirty water in our country may be, we can do our part by installing good and trusted water filters at home. And now, I can even ensure that we have clean water to drink from when we travel to different places! the water filter, attachments, as well as an easy to understand step-by-step guide on how to install the water filter by ourselves at home. It's small and compact enough to bring around for travels. Only almost as big as my palm size (and I have relatively small palms). Its compact size is perfect not just for travels, but also for our kitchen cos we live in a condo unit so space is limited. With a small kitchen, it's difficult to find space for a large unit of water filter, so this compact water filter is PERFECT for small homes like ours. I'm lucky to have a resident engineer at home who, by default, installs and fixes all our home appliances while I stand beside him to cheer him on. Hahaha!! But I must say, Cleansui has made it easy to install as they believe in making it convenient for their customers. All we used was just ONE screwdriver, and that's it! Every faucet is different so you gotta make sure before you purchase that it suits your kitchen faucet. It doesn't go well with state of the art designer faucets, by the way. No way you can install it! But if you're using any regular faucet like mine, then there wouldn't be any problem. And we're done! Clean water for the whole family (Boon, me and bean)!!! You can refer to this video by Cleansui on how to install the water filter! 3) It has a filter expiry indicator! The water filter that we used previously only tells us when the next filter change is after X number of years. We were given a sticker to paste onto our water filter so that when the day arrives, we know it's time to change the filter. 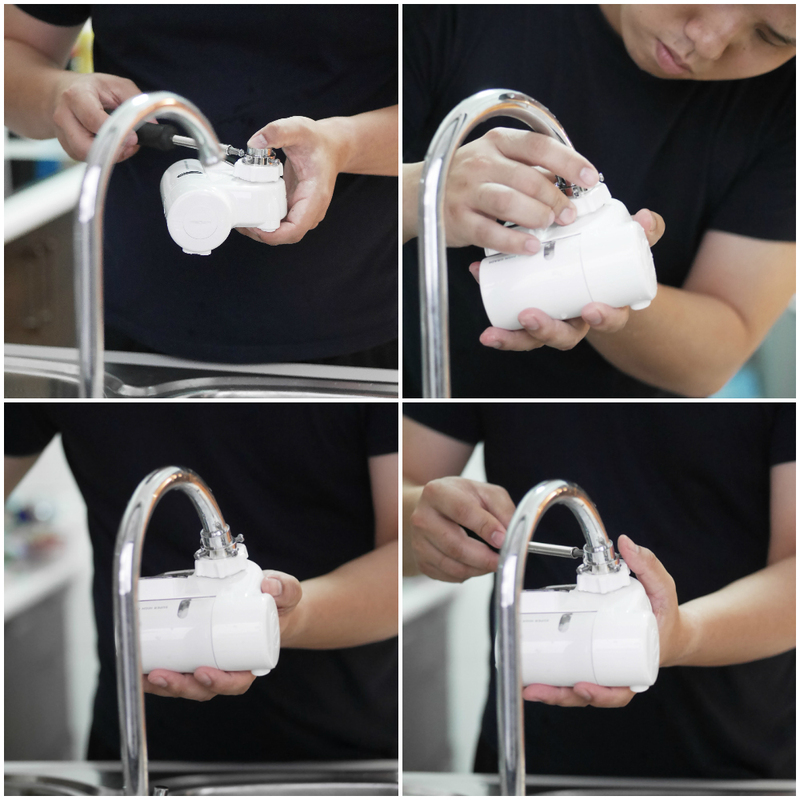 For Cleansui, instead of a given fixed date to change our water filter, it has an in-built water filter expiry indicator that tells us how much of clean space is left in the filter itself. If our water source is clean, the filter indicator will run slower but if our water is very dirty, the count will go down faster. I personally feel this method of expiry indication is much more accurate cos for all we know, our water filter is way expired but our sticker tells us we still have 6 months usage til the next change. Then we'll be innocently drinking 6 months of non-thoroughly filtered water because our filter just can't handle it no more! The count starts from 900, and the number decreases depending on the amount of water dispensed. After one month, our count dropped from 900 to 870. This might be cos we also have an outdoor water filter so the water isn't thatttttt scarily dirty because of it. Once your water filter reaches its lifespan (indicator reaches 0), you can get a new filter cartridge delivered to your doorstep for FREE by placing your order online via this link! Oh yeah, you can also switch from normal tap water to filtered water simply by turning the lever up or down (as in photos above). Remember I mentioned above I used to think that Cleansui water filters must be expensive since they're known to be good and also because they're from Japan? Well, when we found out the actual pricing of their water filters, we were super surprised. Their water filters are priced between RM239 - RM1,199 (depending on product) even after GST and all the inflation rates. That's a fraction of a price compared to so many other water filter brands I know! You can check out their products available and the prices on their website HERE. The Cleansui CSPXE water filter that I'm currently using cost RM599 (with a filter included in it), and replacement filter cartridge cost RM299. This brings me to my last point. 5) Cleansui offers FREE DELIVERY! One of the things that I'm most thankful for these days is FREE DELIVERY!!! That's why I love online shopping so much! Find out more about Cleansui Malaysia on their Facebook and Website.